The school shooting in Red Lake comes only 18 months after another shooting killed two students at Rocori High School in Cold Spring. Faculty and staff at the central Minnesota high school were ready to give students the help they needed. But school officials say they were surprised to find that students were more concerned about how to help those on the Red Lake Reservation. Collegeville, Minn. — Officials at Rocori High School quickly put together a plan of action for their own school as soon as they heard about the shooting at Red Lake. They wanted to support students if images from the latest tragedy stirred up old emotions. When students came to school, counselors were on hand. Rocori High School principal Terry Bizal says a few students talked with counselors about the Red Lake shooting, and the shooting that happened at Rocori in September of 2003. But for the most part, Bizal says his students were doing remarkably well. "This is a resilient student body. Once the initial shock was overcome, we started discussing our actual plan to help ourselves, and eventually help Red Lake," Bizal said. Rocori held to a fairly normal school day. It was up to individual teachers to decide how their classes would discuss the day's news. Later, students were given time and space for silent reflection. "They coud go to another area in the building and write phrases of hope on large posters we'll send to Red Lake," said Bizal. "We hope that Red Lake knows we are with them, and we understand what they're going through. But it will also help in our healing process, too." That's the same way Rocori started to heal in the days after their shooting. 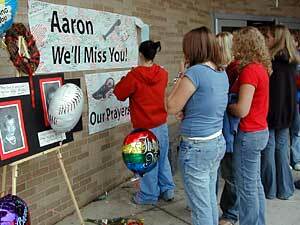 Students and staff filled the halls with murals which contained notes and tributes to the friends they lost. It's a healing process that Cold Spring is still going through, 18 months later. Bizal says even though they're still reeling, Rocori students and faculty are now the ones offering support. We hope that Red Lake knows we are with them, and we understand what they're going through. But it will also help in our healing process, too. "We've come to the mentoring stage of this horrific event. That's very sad. I hate to say it, but reality will probably dictate that Red Lake will be a mentor for someone else. Hopefully that never happens. But that's the position we're in, that's the reality we live in and that's part of our history now," Bizal said. Rocori students have already started a fundraiser for the students in Red Lake. Just a year and a half ago, they were on the receiving end of the fundraisers, and now they say they want to return the favor. Rocori officials say they're ready to help out and share what they can. They've learned a lot since their shooting. They know how to handle students, parents, teachers and the media in the aftermath of such a tragedy. The Rocori superintendent wasn't able to be at his school on this important day. Scott Staska was in Washington D.C. Ironically, he was there to talk with federal officials about the delay in government help for crisis counseling after the Rocori shootings. School board Chair Lynn Schurman says the government promised federal grants to pay for the counseling. The school district waited for nine months for the money. "We want to make sure that other districts have a process that is more expedient in dealing with their mental health issues in a time of tragedy. We need to have those resources much sooner than what we were provided," Schurman said. The people at Rocori High School say that's something they hope is in place as Red Lake High School starts its healing process.